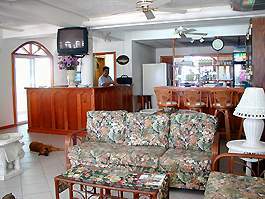 Large tropically-decorated lobby for our guest's enjoyment. Generator backup during all electrical outtages for the lobby ONLY. 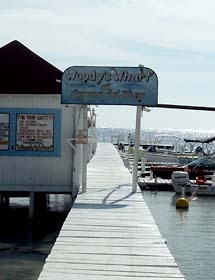 It is located "right on the beach" at Woody's Wharf, approximately a half-a-mile south of San Pedro Town, a quaint and unique fishing town situated less than a mile from the world's second largest living barrier reef teeming with sea life. Remember to bring your underwater cameras because visibility runs from 75 to 150 feet. 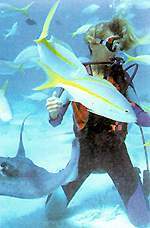 Diving or Snorkeling at the famous Hol Chan Marine Reserve and Shark Ray Alley, Mexico Rocks, Rocky Point, Coral Garden and Tres Cocos are fantastic insights into a whole new beautiful undersea world! Don't miss this great opportunity! Dive boats and glass bottom boats (for snorkeling etc.) will pick you up at our dock. The flats and deep sea fishing are an angler's delight! When the lights go down, the fun heats up! 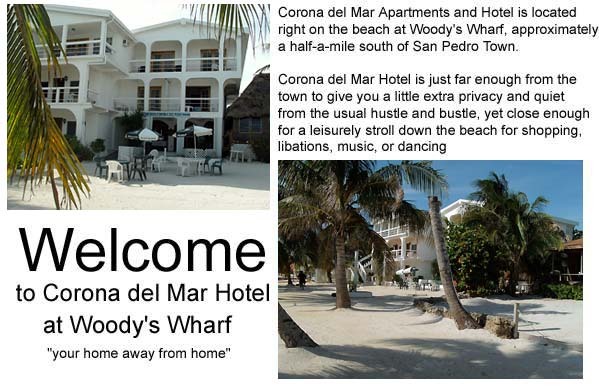 Enjoy the night life in the town of San Pedro with reggae music, the Lively "Piano Bar" at Big Daddy's Disco, "Oldies but-Goodies" live music (guitar, drums & vocalist) at Fido's outside patio (on the beach nightly at 9PM), Caramba Restaurant, the El Patio Restaurant, Elvie's Kitchen for Belizean "rice & beans with chicken" and a variety of American dishes, the Wednesday fun night starting with the famous "chicken drop at the Pier Lounge, a great "BBQ" and live music "on the beach" at the Holiday, and George's Kitchen Restaurant directly across the streetg from Woody's Wharf featuring Lobster & great seafoods for your enjoyment! 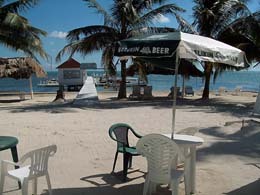 The Belizeans... a people with Mayan, British, Mexican and Caribbean cultural heritage, are warm and hospitable. The government is a stable democracy with a parliamentary system very similar to that of Great Britain. 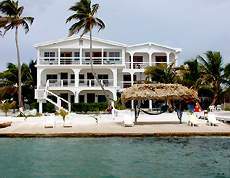 Belize became an independent country in September 1981. It was previously known as "British Honduras". Its laws are very similar to those of the U.S.A. as both are derivatives of the British "Common Law", so relax and enjoy your stay. International Flights - TACA International Airlines, American Airlines and Continental fly to Belize International Airport from the gateway cities of Miami, Houston, New Orleans, Los Angeles, New York and Washington, DC. 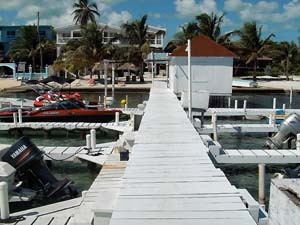 A valid passport is required for entry into Belize. 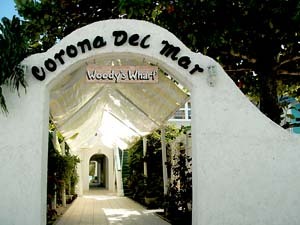 Corona del Mar will help you and your family arrange an exciting adventure. Try our Caribbean paradise... you will be glad you did! 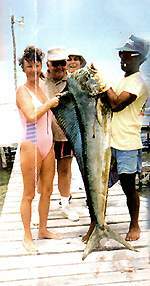 Enjoy unspoiled fishing: Tarpons, Barracudas, Snappers, Groupers, Eagle Rays, Jacks, and more. Dive in our famous Blue Hole, offshore atolls, coral caverns, walls, shipwrecks shallow gardens of Brilliant corals and fabulous drop-offs!!! Trip to the Mayan ruins Xunantunich, Altun-Ha & Lamanai Also to the Mountain Pine Ridge, Rio Frio caves, Hidden Valley Falls, and much more! Don't miss your opportunity to visit the quaint fishing island of San Pedro Town. 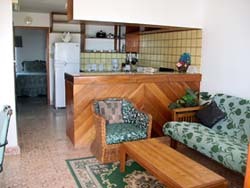 $70.00 US Sunset room without balcony, additional of 19% tax and S/C. $80.00 US Sunset room with balcony, additional of 19% tax and S/C. 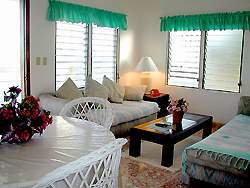 $90.00 US Standard Ocean Front room, additional of 19% tax and S/C. $100.00 US Penthouse Ocean Front room, additional of 19% tax and S/C. 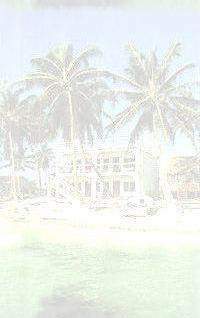 $120.00 US Ocean Front Apartments, additional of 19% tax and service charge. $85.00 US Sunset room without balcony, additional of 19% tax and S/C. $95.00 US Sunset room with balcony, additional of 19% tax and S/C. 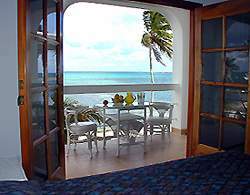 $105.00 US Standard Ocean Front room, additional of 19% tax and S/C. WE OFFER COMPLIMENTARY RUM PUNCH OR FRUIT PUNCH ALL DAY LONG!!! DON'T MISS OUT! WE ALSO OFFER A COMPLIMENTARY CONTINENTAL BREAKFAST EVERY MORNING FROM 7-10AM. IT BASICALLY CONSISTS OF: BOILED EGGS, 4 DIFFERENT KINDS OF TROPICAL FRUITS, TOAST WITH A CHOICE OF PEANUT BUTTER OR JAM, SWEET BREAD, COFFE, TEA OR JUICE!!! If you need additional information, please let me know. We look forward to hearing from you. For more information, on the rooms, tours, and amenities, Click Here! 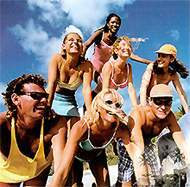 All rates double occupancy, and prices do not include 19% government tax and service charge. A deposit of 50% is due upon confirming of booking with balance due 45 days prior to arrival. Full refund, less $50.00 cancellation fee to cover booking expense will be granted if cancellation is received no less than 45 days prior to departure, except holiday cancellations which are required 60 days prior to departure. Unused portions of accommodations, meals, and activities are non-refundable.